De Crignis shows a group of tempera on paper paintings from 1991. These works are made-one is tempted to say constructed-by painting several layers of one or more colors (such as red or green) and black. The almost imperceptible grid is the trace of both the wide brush used to paint, wet-in-wet, the tempera, and also of the vigorous gesture, the dynamic of their realization. The process of painting is intently foregrounded, as is the acute sense of color, the contrasts between the colors and the black. But there is something else at work here, a quality that actualizes an almost sculptural, rather than purely pictorial sensibility. In these works De Crignis imparts a material sensibility to the surface of the image: in this way the eye can enter within the works, and not merely graze the surface. In investigating the materiality of the surface and interstitial-infrastitial, even-spaces of the picture, De Crignis established a practice that he continues to the present. 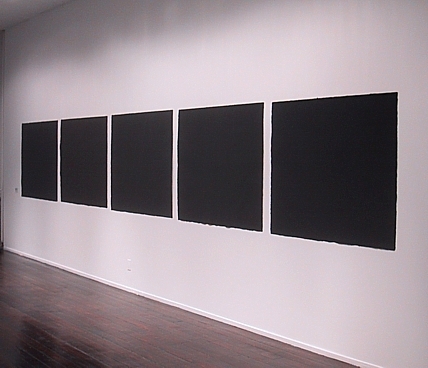 By contrast with the presence of the "black" paintings the pencil on paper works display an almost impalpable lightness. Made by delicately inscribing pencil lines onto thin white card and then erasing them, the images are also constructed from accumulative layering. However, unlike the comparatively simple stratification in the paintings, the erasure permits only a slight trace to remain, presenting an evanescent, rather than a substantial, reification of De Crignis' concerns.